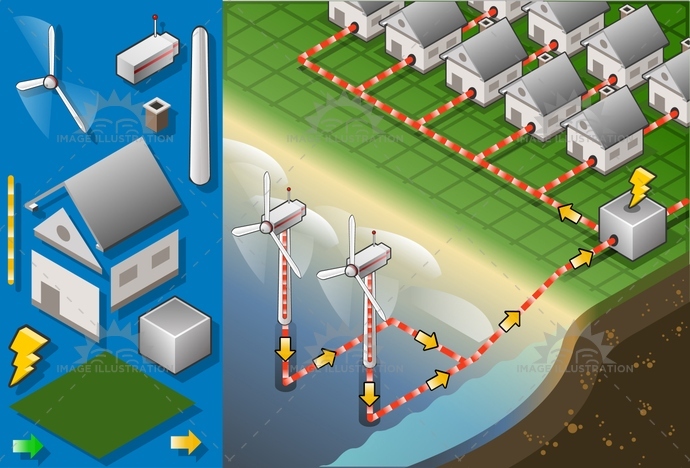 Stock product - detailed vector illustration - Isometric Building Collection - Offshore Turbine 01 - created by Aurielaki. Image formats EPS AI JPG. SKU: Offshore-Turbine-01-Building-Isometric-AurielAki. Category: Energy Chain Set Vector 3D. Tags: alternative, beach, clean, Diagram, eco, ecology, energy, environment, environmental, Generator, grass, green, house, isometric, ocean, offshore, plant, power, PowerStation, renewable, Resourceful, sea, technology, tower, town, turbine, wind, windmill.